Desktop DJs and voiceover artists take note: Joemeek is coming over and he wants to move into your spare drive bay. Fletcher Electronics, based in Torquay, England, is known for its line of bright green preamps and compressors inspired by Meek, the late pioneering engineer. With the introduction of the MQ1 recording interface ($299.99), Fletcher takes classic Joemeek circuitry and retrofits it into a green drive bay-mountable box for the desktop reco rding market. The MQ1 is one of several devices in the relatively new “MicroMeek” range. 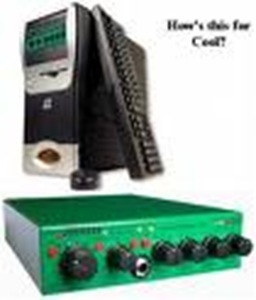 These diminutive products feature the same circuitry found in the bigger, more expensive Joemeek products but with fewer features (no analog VU meters, built-in power transformers or full rack cases). The audio signal path, however, has not been downsized – the MicroMeek line boasts the famous Joemeek sound as their big brothers. The MQ1 mounts in a PC or Mac drive bay and works in conjunction with the computer’s existing sound card. The unit derives its operating power and +48 volt phantom power directly from the computer power supply. With the exception of a front-panel instrument 1/4-inch input jack, inputs and outputs are accessed via a panel mounted in the back of the computer. This panel is host to a pair each of balanced 1/4-inch auxiliary inputs and main outputs. An XLR breakout cable emanates from the top of the panel, just under which is a +48-volt phantom power button. The front panel of the MQ1 is densely populated with knobs, switches and LEDs, yet they are laid out in a logical manner. A switch enables MicroMeek microphone or instrument input when turned on. When off, the auxiliary inputs are fed directly to the computer’s sound card. The next two controls are the input gain and compression knobs. Input attenuates the incoming level fed by either the XLR microphone line or 1/4-inch instrument jack. It has no effect on signals at the auxiliary inputs. The hybrid compression knob essentially acts as the optical compression circuit’s “threshold” control. The ATT button chooses between two preset compressor attack times (1 or 5 ms) and the REL button sets the release time of the compressor (500 or 1,500 ms). Next is the Meekqualizer section, a three-band +/-16 dB EQ. The LF and HF knobs are shelving filters set to 80 Hz and 8 kHz respectively. The MF filter is a peaking filter centered around 1.8 kHz with a Q value of one. OUT VOL is a final stage volume control for the output of the MQ1. It operates after the three-stage LED VU meter and does not affect the overload margin. In keeping with the computer product paradigm, Fletcher Electronics forgoes a printed manual in favor of an electronic version provided on an enclosed “installation” CD. The CD contains demo software from Sonic Foundry, Cakewalk and others. I put installation in quotes because, with regard to the MQ1, there is no software to install. Here I think the MQ1 is being marketed in a misleading way and I am not sure why, for the MQ1 is a worthwhile idea that sounds great and is a great value. Fletcher Electronics should be more straightforward with what it has: a single channel preamp, compressor and equalizer that has no dealings with the host computer other than that they utilize the same power supply. This last bit is more than a little confusing because it clearly implies the ill-named Connection Card is a card that mounts in a card slot, though it is simply a back plane-mounted breakout panel to access the unit’s audio I/O. Marketing rant aside, the MQ1 sounds and acts like the other Joemeek products I have used (and owned) – and that is a good thing. Once I found the ideal ground connection within my computer (grounding cable included), I experienced no unusual buzzes, noises or hums despite the unit’s proximity to the sonically hostile environment inside a computer. The vocal quality that the MQ1 and similar Meek units produce is perfect for voiceover and broadcast use. With proper adjustment of the compressor and equalizer sections, the resulting vocal sound can only be described as warm and full, yet upfront and present – crisp yet commanding. It doesn’t get any better for radio. For experienced audio producers, operation of the MQ1 is intuitive. For beginners in audio production, operation of the unit should be straightforward and learned quickly, provided they read the well-written basics explained in the brief electronic handbook. Despite some identity issues, there is no doubt the MQ1 is another great-sounding product from the Joemeek/Fletcher Electronics folks. The MQ1 is designed especially for those who record to a nearby computer. As with any other recording channel, frequent visual and hands-on access of the MQ1 is required for proper setting of gain structure and compression – make sure that mounting the Meek unit in your computer will not be overly limiting. For more flexibility in preamp placement, consider the slightly more expensive MicroMeek MQ3, a standalone model with its own power supply (wall transformer) and a few extra features. Either way, you won’t be disappointed with the sound.